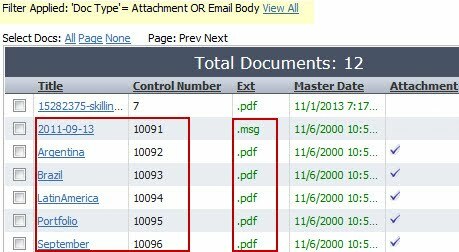 This unique string of consecutive numbers are part of the Built-in fields, which are like Bates numbers (sequential and can be printed on documents) and can be automatically assigned during after a batch upload in Lexbe eDiscovery Platform (read-only value). Control numbers simplify the cumbersome tasks of managing document revisions, assembling document issues, and maintaining the project document review before Bates Stamping is applied to the actual production. It is 'document specific', which means that the same control number is applied to the whole document. When you open a PDF file, the same control number will be displayed in all the pages. This feature will order email attachments after the email body for MSGs, and you can filter and sort with attachments to emails nested after the email, then doc title. >After all uploads in the queue have been completed, please select the batch(s) you want to assign control numbers, and then click on the 'Assign to Case Docs' button. >It will start from a given initial given number of digits (e.g., '1'). Once document controls have been added to a batch of files, this feature will also automatically check through the entire library to ensure the numbers are not duplicated on any other documents, which means that if you decide to apply control numbers to subsequent batches of files this feature picks up where the last control number was left off. This will avoid the possibility of two users creating the same document control number and at the same time. There will be only one control number, created and viewed after the document has been added to the case. 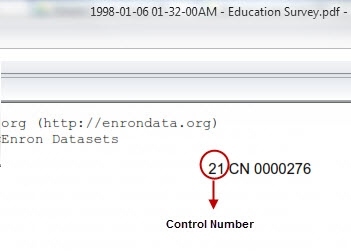 Each document control field has a unique string of numbers across the entire case. It will be printed on the bottom-right page if you select the option from the Download Briefcases dialog box. Before you delete any Title of Batches from the Case> Add Case Documents, be sure that you applied Control Numbers (if needed). You will lose the ability to apply control numbers to the documents uploaded from specific batches, it has been removed from the upload page. If you uploaded files to your case(s) before the release of the batch file upload and would like to have Control Numbers assigned to your documents, please submit a ticket at our customer support requesting that feature from Lexbe eDiscovery Platform listing the exact case name, case number (ID) and any filter you might have applied to select a set of documents. NOTE. This service is free of charge only for old cases uploaded before 01/24/2013. From the Browse and Search pages, you can select documents and the Control Number column to export to an Excel spreadsheet. The Excel log allows you to generate a report that can be filtered, sorted for further analysis in Excel. Lexbe eDiscovery Platform supports the two most recent versions of Excel for Excel integration (2010 and 2013) and we recommend an upgrade from previous versions of Excel before you start exporting logs.